Even though warm weather is coming...slowly, we are still at the tail end of Winter produce. 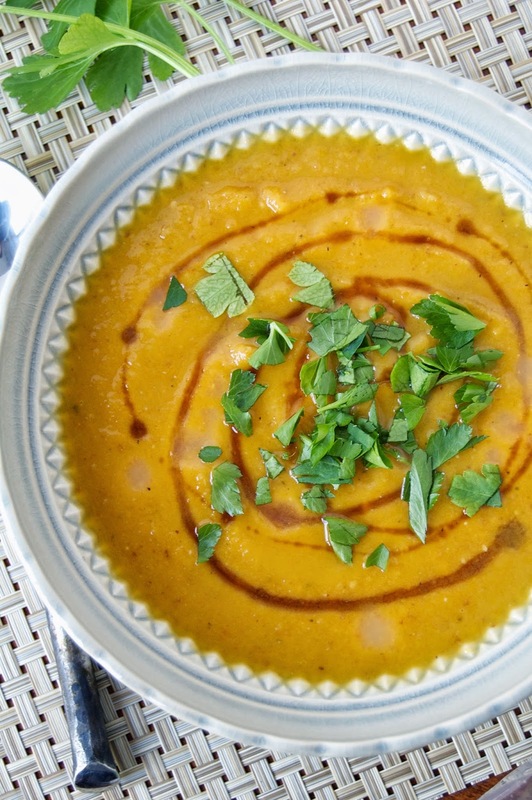 Soup is the perfect easy dinner to keep me warm as the evening turns chilly. 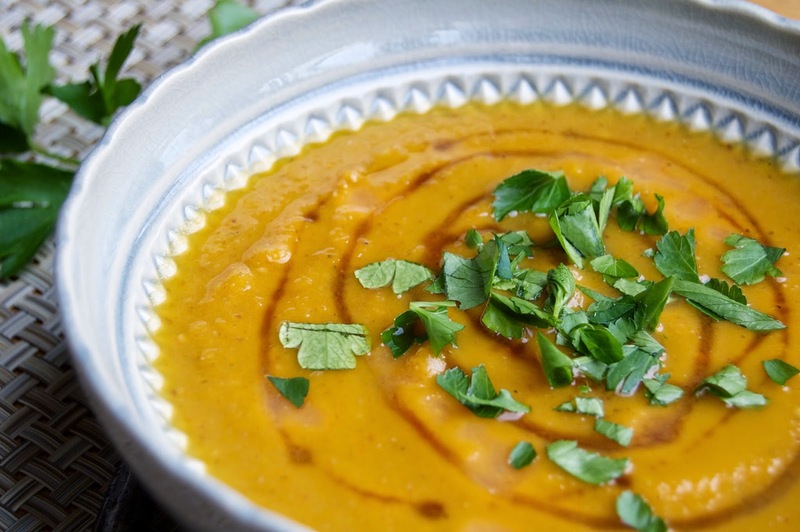 Using the carrots and sweet potatoes from the last of the Winter harvest makes for a perfect base for soup. During the month of February, I was sick for probably 20 of the 28 days! It was a rough month, and soup got me through most of the sniffles, sneezes and freezing cold weather. As Spring approaches, I have a few soup dinners planned for the Hubby and I to keep us warm during the chilly nights. I love carrots and always eat them. It seemed like an orange match made in heaven pairing them with sweet potatoes, another favorite vegetable. I first made this soup during one of the snow days in February. The Hubby loved it and I knew it would be the perfect dinner for the chilly nights ahead this week. In a large, thick-bottomed soup pot, melt the butter over medium heat and sauté the onions until translucent, around 7 minutes. Stir in the garlic and ginger and sauté for another few minutes. Add in the sweet potatoes, carrots, dash of salt and pepper and continue to cook while stirring. After 2 minutes pour in the broth, bay leaf, coriander, chili peppers and thyme. Stir well and cook covered for 20 minutes over medium heat. Check to see if the sweet potatoes and carrots are well cooked and soft. If not, continue to cook for 5-10 more minutes. Pull out the bay leaf and discard. Using an immersion blender, puree the soup until desired consistency. 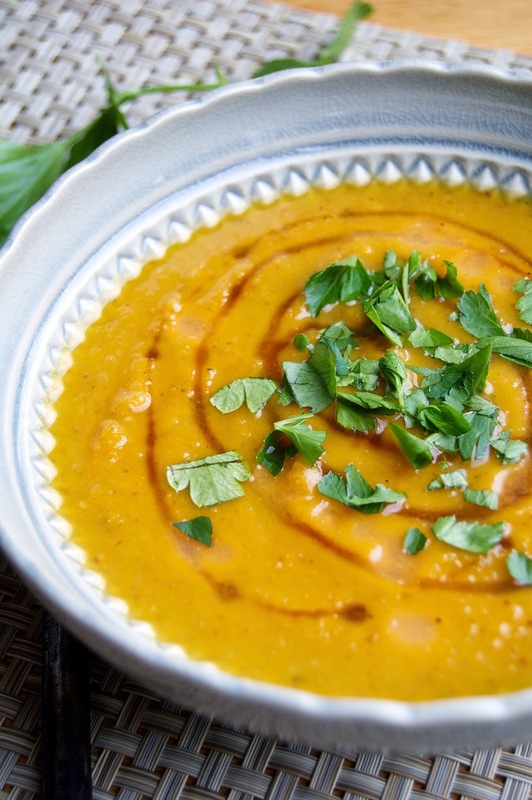 You can also use a blender to puree the soup (most likely in batches). Serve with a drizzle of maple syrup, fresh parsley and juice from a lime wedge, all to taste. After a month-long unintentional hiatus from the blog, I have racked up many recipes to share. Unfortunately, my Mac broke right after Valentine's Day, which basically means my lifeline to blogging had to be sent in for repair and I was left with many ideas and the old fashion pen and paper. Alas, I have been reunited just in time for Spring. Today, I'm sharing a super easy recipe using raab. 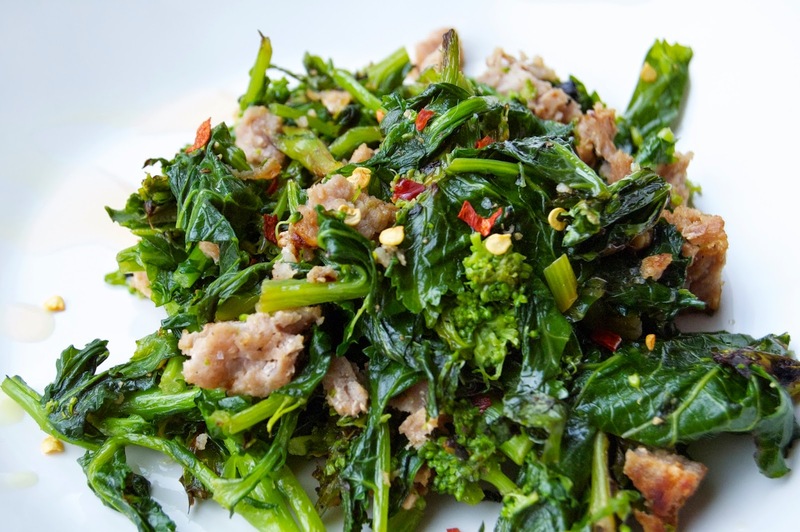 Probably the most common is broccoli raab, which is often referred to as Rapini. 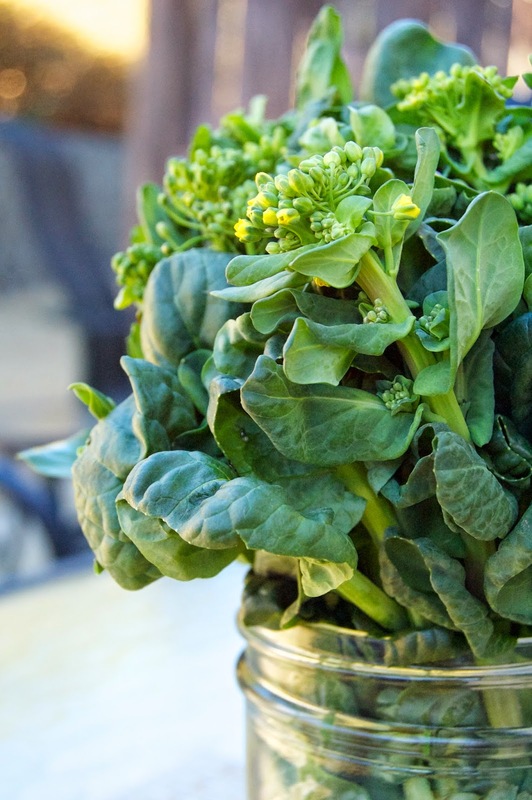 Raab is a cruciferous veggie, usually appearing as thin stalks and greens with little florets speckled throughout. I don't see types of raab in the grocery store very often, but it is all over the Farmers Market lately. 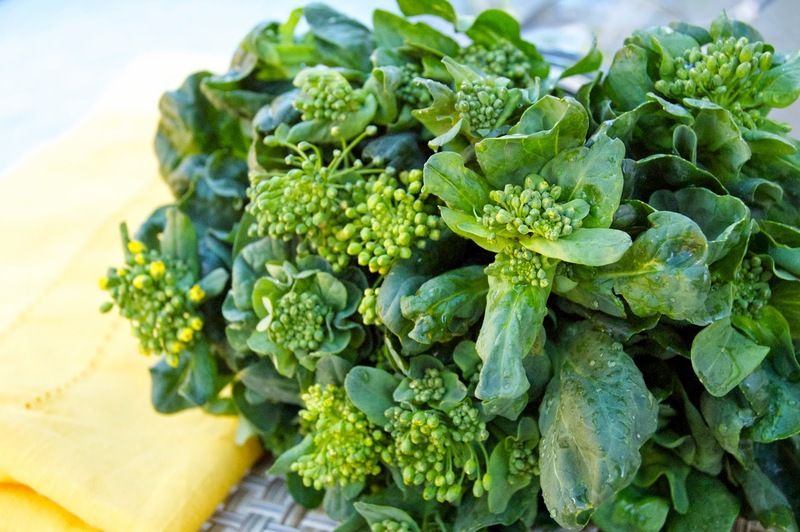 Several farmers at the Market have offered different kinds in the last few weeks; chard raab, winter greens (brassica) raab and this week I found a mixture of mizuna and tatsoi raab. Thank you ColorFields Farm! Raab can be, and usually is a bitter vegetable, which I know the Hubby isn't a huge fan of. However, with a little sausage, spice and acidity, it turns into a side dish that he goes back for seconds of. This recipe for Raab and Sausage is very versatile. You can use your favorite kind of sausage and whatever kind of raab you can find. You could even just use a bitter green like mustard or turnip greens. Sauté away!! In a large sauté pan over medium heat, cook the sausage and break into smaller pieces. Once the sausage is cooked through, remove to a paper towel lined plate, reserving the rendered fat in the pan. 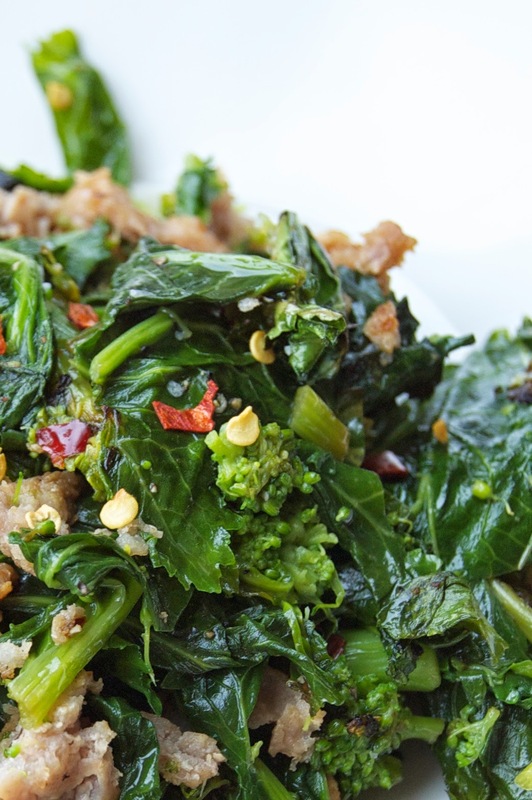 Add the prepared greens/raab to the pan and cook for about a minute, stirring several times to coat the greens/raab. Pour in the 1/4 cup water and cover the pan over the heat for 2-3 minutes (this will steam and cook the greens without burning them). Remove the lid and make sure the greens/raab are cooked to your desire, then stir the sausage back in along with a pinch of salt, pepper and the red pepper flakes. Remove from heat and serve with a small drizzle of olive oil and lemon juice if you want. If the raab mixture is still to bitter for you, add a bit of sugar or honey to balance out.